Go Green with EcoBuddies: WOW: WE ARE GOING GREEN! My name is Violet! 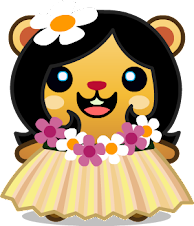 Many of you probably have seen me at the dance studio on Tiki Island! Other than dancing, I LOVE to study how to be green. You know, because I want to be a marine biologist when I grow up! I love the ocean and I love animals! This is a place where we can talk about being green and how we can support the environment. Please send me ideas of what I should write, kk? You can email me at my friend's email address at ferma@ecobuddies.com! I will be posting games, info, facts, and all kinds of stuff here! We will have SO MUCH FUN! Anyhow, I should get goin for my dance lesson!